The main reason why people use potato ricers is to make lighter, fluffier potatoes for various dishes where traditionally cut potatoes don’t really fit into. While mashing potatoes blends them together in a mush, with riced potatoes you get fluffier potatoes that you can shape any way you want. This is perfect for when you’re trying to prepare a dish that involves potatoes and warm gravy on the same plate; or when you’re trying to make applesauce or smashed fruits for preparing jams. Either way, you’re going to need a decent potato ricer if you’re thinking about getting one. 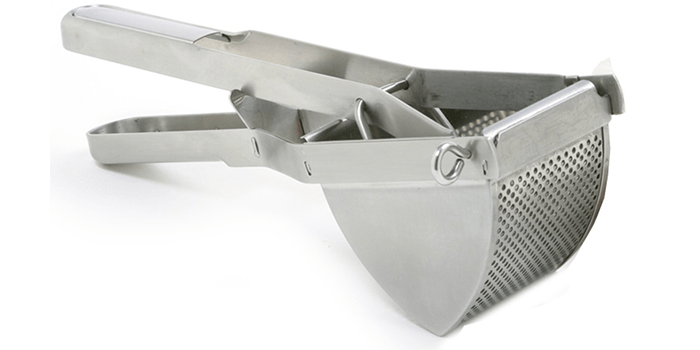 We can help you in that regard as we took the time to put together a list of the ten best potato ricers the market has to offer. 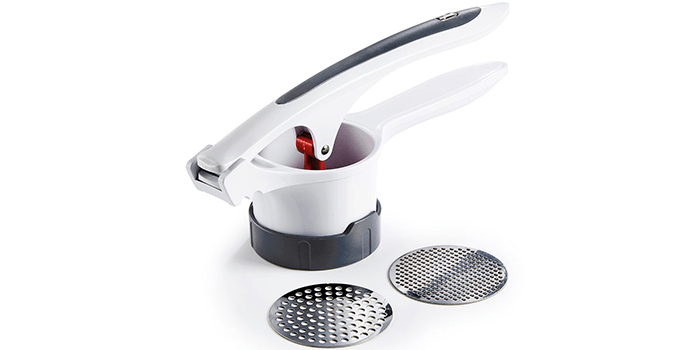 The Zyliss Potato Ricer is a multipurpose kitchen tool that can be used as a potato masher and a spaetzle maker. Ideal for pureeing vegetables, preparing smooth creamy, lump-free mashed potatoes and more, it comes with two ricing plates crafted to create a coarse or fine consistency. Made from premium quality materials, it is constructed with a contoured handle with a soft grip and a convenient pot rest. For easy changing of rice plates, the base can be removed and also helps with easy cleaning. Featuring a handle that can be detached, it allows easy storage and is space efficient. 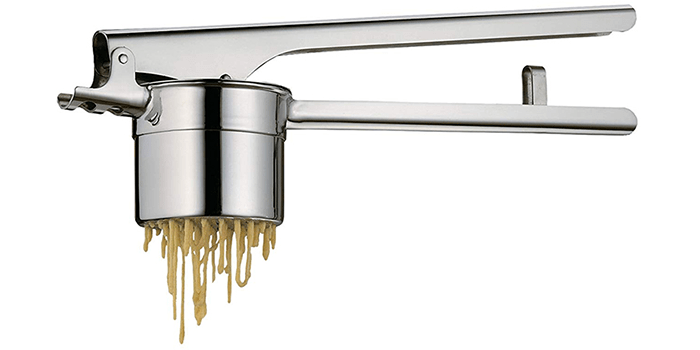 Crafted to make smooth, light, and lump-free mashed potatoes, sauces, soups, and pureed vegetables, the Kuchenprofi Potato Ricer is a heavy-duty gadget that can also be used to prepare spaetzle. Easy to operate, this device is made with 18/10 premium quality stainless steel and is ultra-durable. A convenient and efficient tool to have in the kitchen, it simply requires a few cooked potatoes or spaetzle batter to create the perfect bowl of deliciousness. Great for baby food, it is safe to use, easy to clean, and dishwasher safe. Unlike any other potato ricers of its kind, this mashing tool from Joseph Joseph features a versatile design and construction. Featuring two pieces that include a top handle with an extruder plate made from stainless steel and a squeeze handle for pushing down on the cooked potatoes, this tool allows you to directly scoop up potatoes from the pan while draining out the water completely. Easy to use and comfortable to hold, it is large in size, durable and efficient. Simply squeeze both handles together to get delicious, creamy, soft lump-free potato mash in seconds. Easy to clean and store, this gadget is dishwasher safe and space-efficient. Featuring a durable and efficient design and construction, the Metaltex USA Inc. Potato Ricer comes crafted with 3 ricing disks made from premium quality stainless steel. Ideal for pressing and mashing potatoes, beans, tomatoes, and other vegetables, it can also be used for making juices, purees, and sauces. With a body made from high-quality ABS plastic, it features a detachable hopper that can be removed for easy cleaning. The disks included offer 3 different consistencies – fine, medium, and coarse, disks that can be changed with ease at any given time. Free from BPA, safe for your family, and ultra-durable, it is easy to clean and dishwasher safe. The Farberware 5216391 Professional Handheld Potato/Vegetable Ricer is a premium grade kitchen tool designed to make the creamiest mashed potatoes and the thickest vegetable purees. Stylish, durable and easy to operate, it features a hand-held construction that allows you to press down the food directly into any bowl or pan with ease. Made from heavy-duty stainless steel with a sturdy handle with a comfortable grip, this ricer easily strains out all the filled contents, providing you with delicious, soft, lump-free results. Thanks to its special twisting mechanism, mashing potatoes with the Joseph Joseph 20100 Helix Potato Ricer Masher is easy and effortless. Ideal for making rich, creamy mashed potatoes, vegetable purees for soups, sauces, baby food and more, this device is an efficient and handy tool to have in your kitchen. Made from sturdy, premium quality stainless steel and nylon, it is free from BPA and certified food-safe. Featuring a 2-piece detachable construction and design, it is easy to clean and dishwasher safe. 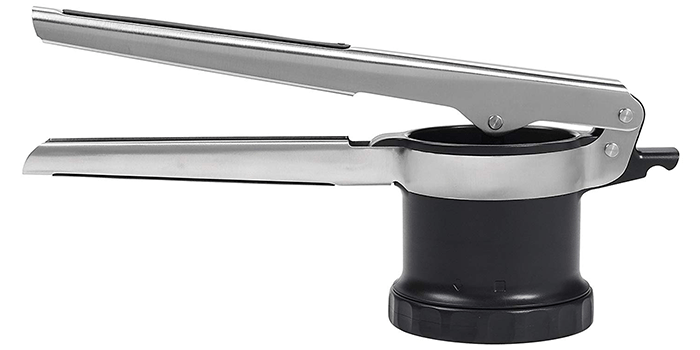 Made with brushed stainless steel with a sturdy handle with non-slip grips, the OXO Good Grips 3-in-1 Adjustable Potato Ricer is a premium grade kitchen tool. Featuring 3 different consistency settings including a fine setting for mashed potatoes or gnocchi, a medium setting for spaetzle, and a coarse setting for sauces like apple sauce, it can be changed by simply rotating the disk clockwise. Equipped with an integrated pot rest, this ricer can sit on bowls and pots without sliding off. For easy cleanup, the disk should be rotated towards the arrow for quick removal. Top rack dishwasher safe, this gadget is durable, efficient and easy to use. Another great addition to the list is the latest professional mash potato ricer from VonShef. 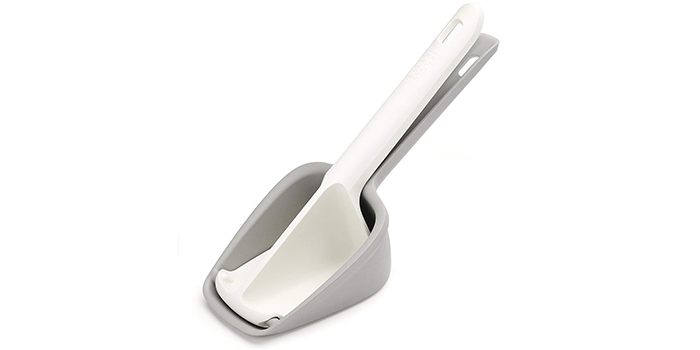 Designed for potato mashing and fruit pressing, this tool can also be utilized to make baby food. Crafted and designed with stainless steel with a mirror finish, it features sturdy handles with a soft silicone padding that is comfortable to hold. 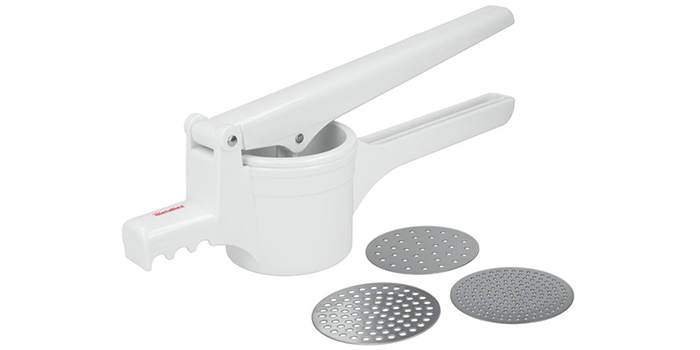 Equipped with tiny holes, this potato ricer produces evenly mashed, creamy rich results with every press. Durable, convenient, and damage resistant to an impressive standard, this ricer is easy to clean and safe to wash in the dishwasher. 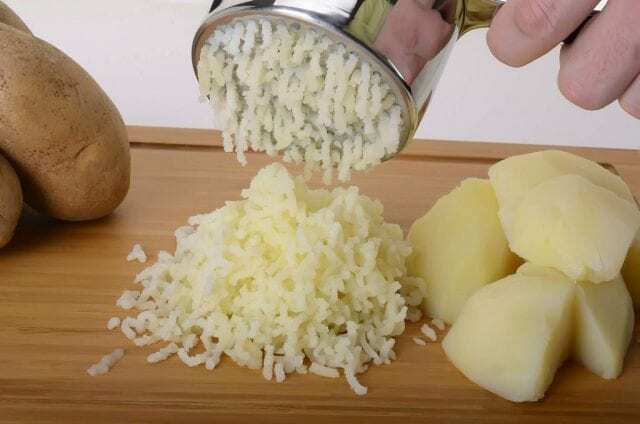 Delivering exceptional results, the Chef’n FreshForce Potato Ricer Press is a high-end kitchen tool that is 65% more efficient than other ricers and mashing tools of its kind. Equipped with a heavy-duty handle that is easy to squeeze, it creates delicious mashed potatoes that you can use in your favorite croquettes, pies and more. Thanks to its special gear mechanism, it helps enhance the force while mashing and eliminates hand fatigue. Easy to clean and dishwasher safe, the perforated basket can be detached when required without using any additional tools of any kind. 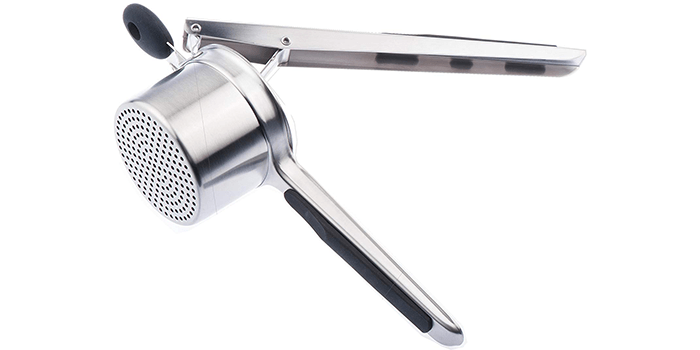 Known for its high quality, durability, and performance, the Norpro Stainless Steel Commercial Potato Ricer is one of the best of its kind. Crafted with the ability to incorporate air into your cooked potatoes, it produces a soft, fluffy and light mash that is delicious and free from lumps. Made from premium commercial grade stainless steel, it features a convenient design and construction that easily fits over any pot or pan, eliminating spills or mess. Ideal for making mashed potatoes, pureed vegetables and fruits, sauces, and more, this ricer can also be used to prepare delicious baby food.